It was the Marsh of the Death from Lord of the Rings, and I am not being dramatic. Chris and I were in a jeep going towards the starting point of the hike. 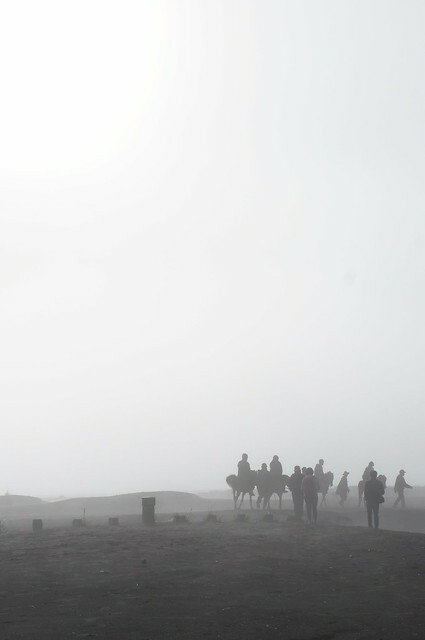 Many of the Tengger people, horsemasters in every right, attempted to earn a few rupiahs from us by offering a ride across the harsh, rocky land on their steads. We politely declined. I was determined not to show any weakness. 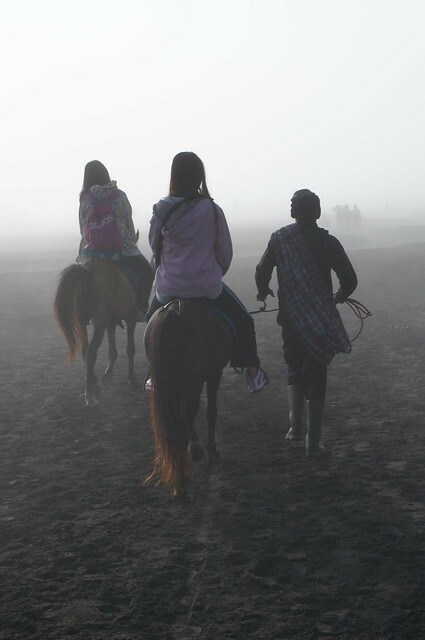 Some 90% of Asian visitors opted a ride on the horseback to get to the Mount Bromo, and I do not want to be part of the statistic. As we make our way to the start of the 250+ stepped staircase to the rim of the caldera, I can’t help but to be awed by my surroundings. Horses bearing their human burden as they marched on, their master keeping a safe clucking distance behind. 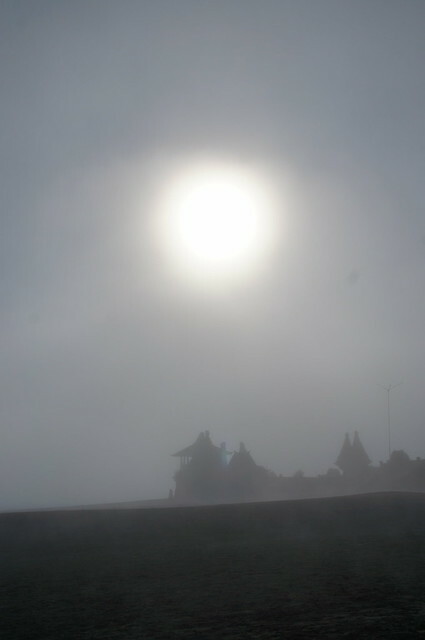 Fog swirled around us as the sun shines on, with an ancient Hindu temple hiding in its midst, silent guardian of this sacred land. It was mystical, and I am not being dramatic. And then we reached the staircase. Of doom. My right knee was already screaming in agony from my previous hike (more on that later) but the caldera lips looked inviting. It was now or never, and so I took my first step. The staircase never ends. 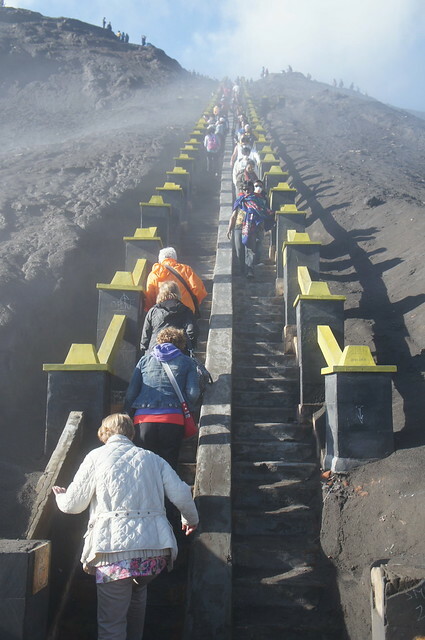 In reality it was only 250+ steps, but in my mind it took forever. 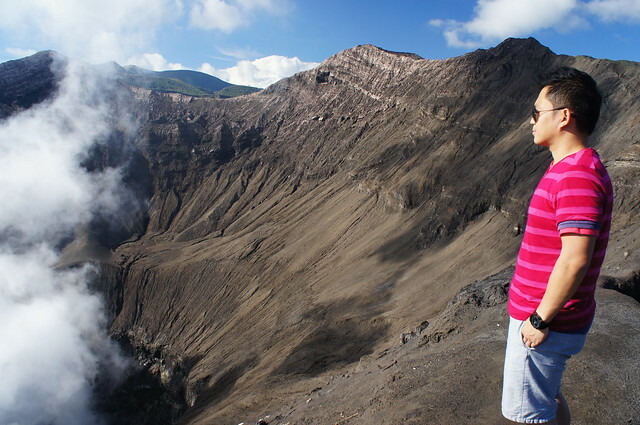 When I reached the top, I looked into the eye of the volcano and cursed it, dimly aware that the locals worshiped Bromo every year with vegetables, chicken and money. I must have been out of my mind, but I was delirious from the pain and the exhaustion. And I am not being dramatic. Well, not as dramatic as the scene that sprawled in front of me. 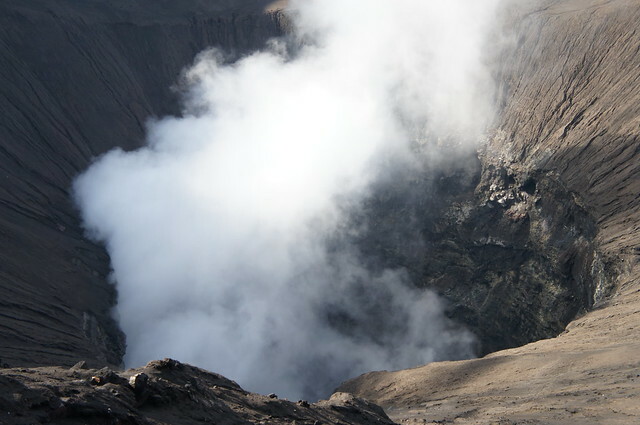 I was looking deep into the volcano that was still smoking, spewing sulphurus gas day after day as if it wasn’t responsible of the fiery destruction that occurred to the towns at its feet every six years of so. To my left and right were tiny walkways that were little more than packed sands, with nothing to stop my fall if I took a wrong step to the left… or the right. I was petrified, breaking in cold sweat, and I am not being dramatic. But I also realised that if I did not do it then, I would have never done it. So with specific, stern instructions to Chris, I took a deep breathe, resolutely not looking down to either of my sides, kept my eyes level and walked on the pathways. And when I reach that spot, I thanked the god of volcano (while hoping they forgive my earlier profanity, really, I did not mean it) and told Chris to take his shots. These were shots to remember. Let me be clear – I was terrified out of my mind, my knees were shaking not from exhaustion but from fear of height, and my heart was racing. I am proud that I did it. And yes, I am not being dramatic. 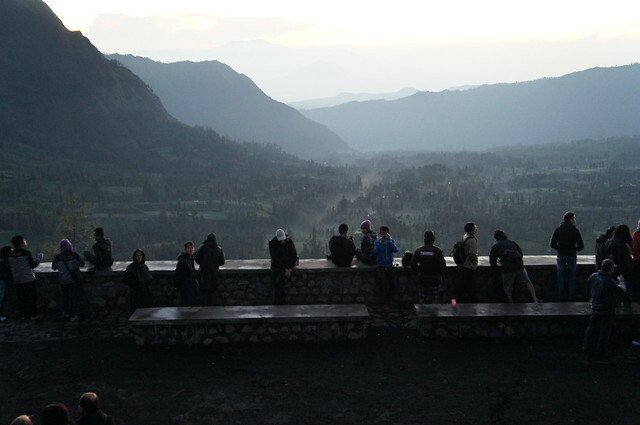 Earlier in the day we woke up at three a.m. (such an ungodly hour) to make our way (in total darkness) to Seruni Point, to jostle with fellow tourists for the perfect spot to watch the sunrise. 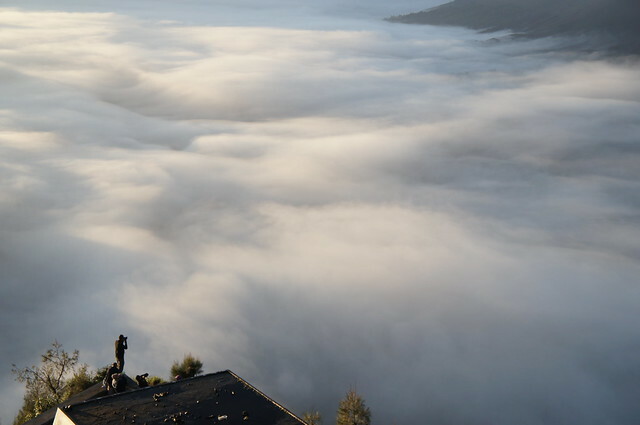 The arduous hike was worth it because of two reasons: (1) the sunrise was truly spectacular, not that I know of any better since this was my first; and (2) the view point offered the signature view of Mount Bromo that spurned many a dreams of rugged travelers to make their way to Java. Which brings me to my last point of this entry – I am really not a nature boy. Try as I might, I realised that I am made of lesser material than I thought I am. 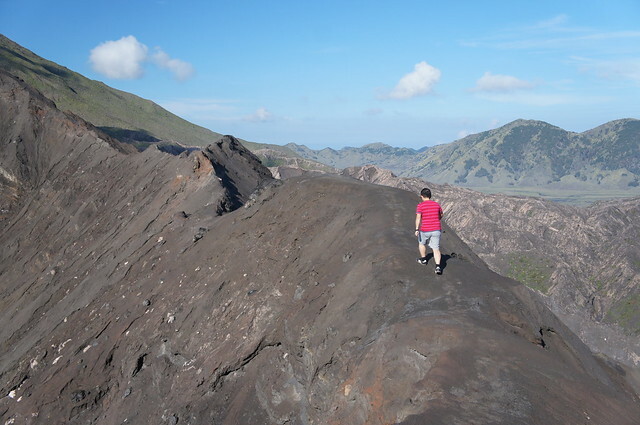 I thought I can rough it out, but hiking a mere 200m+ to the viewpoint made me speechless for the first thirty minutes before I could truly drink in the vast sky above me with its hundreds of sparkling stars, the pink-hued golden sky as the sun inched its way upwards, and the volcanoes of Java stood majestically to the side, all the time luring us to take just that one more hike. I can’t help but wonder – why does a man want to endure such a torture of nature? The answer does not stray far from this: Though I would vehemently deny it, but in all honesty I don’t think this would be my last ever hiking dream. And no I am not being dramatic. Glad u made it. The view is definitely spectacular, although I only arrived at lunch time as we stayed in Surabaya the night before. Should have stayed up in the mountains as you did.